A dental bridge consists of two crowns and a pontic, or replacement tooth. The two crowns fit over the two natural teeth that are on either side of a gap, and the pontic fills in that gap. Realistic Functionality | A dental bridge is a permanent tooth replacement solution. Bridges stay in the mouth at all times, just like real teeth do. Long Lasting | Studies show that bridges last for years and years, so you don’t constantly need to worry about replacing your new teeth. Better Bite | Dental bridges will restore the natural strength of your bite, so that you can chew and bite down normally. Bridges distribute force evenly for a more comfortable and better-functioning bite. Non-Invasive | If you need replacement teeth but surgeries are not appealing to you, dental bridges are a non-surgical and less-invasive away to complete your smile. Beautiful Appearance | Both the crowns and the pontic of your dental bridge can give your teeth a better shape and color. The porcelain that we use at Quality Dental Care is natural-looking, bright, and attractive. A dental crown is a permanent tooth-shaped device that covers the tooth. When your dentist cements your crown into place, it will cover the entire visible portion of your tooth. Protect and Strengthen | Dental caps will cover your weak or damaged tooth, fortifying it from further decay or disturbances. Change the Shape | Dental crowns can make fractured, broken, or ground-down teeth look full and beautiful again. You can give your smile a better shape by utilizing crowns. Top Off Dental Implants | If you choose to get dental implants, or replacement tooth roots, dental crowns will serve as your replacement teeth, giving you the look and feel that you want. Fix Discoloration | Caps can improve the appearance of your smile by making a dark or discolored tooth white and bright like the others. Perfecting your smile doesn’t have to be complicated. 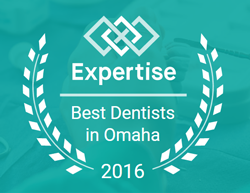 Give us a call in Omaha to learn more about our dental bridges and crowns.